← Chemo Round 6 – Down! 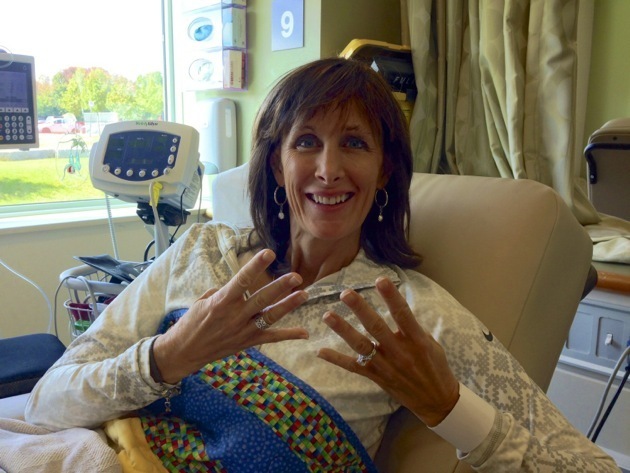 This past Friday marked my last chemo treatment: 8 out of 8 completed – YAY! It almost seems surreal! The next best news is that they have sent in the request to have my Port-a-cath removed, so I will soon be rid of that as well :-). Although it has been convenient to have the port, it will sure be nice not to have that lump sticking out of my body like an illegal alien! Many people say things like “having cancer was the best thing that ever happened to me”. I’m not so sure that I would go as far as to say that, but I would say that I am learning a great deal about myself during this time. I’ve reflected a great deal over the past week, going over my journey in my memory – the good times and the not-so-good times. From losing my breasts, to losing my hair….and a few brain cells along the way that we attribute to ‘chemo brain’, to the excitement of this stage of it coming to a close – I am, after all, now considered a ‘chemo grad’. Words can make such a difference in a person’s path in life. The overwhelming messages of positivity that I have received on this path has been nothing short of amazing – thank you ALL! My thoughts turn into reality, so I need to monitor them carefully. If I focus on being happy, I will be – simple, right? When my body is acidic it can be a breeding ground for C and other aliments. Stress and anxiety causes acidity. I’m learning to let little things that bother me go – it is not healthy to let them fester into more! I am more aware now than ever, of how important it is to be chemical free. Chemicals can deplete our health and cause disease! From makeup, to food, to various other things in my surroundings, I am seeking a chemical-free existence. While I am certain this might be a difficult challenge since there are many things we cannot control in our surroundings, I am committed to changing what I can. I now read all labels before I buy – especially on products that I use on my body such as makeup and lotions, as well as food and household items! I have finally realized and accepted that I am well-loved 🙂 and I cherish that! While I’m sure there are many more lessons learned than the aforementioned, those were the main ones that came to mind as I was writing this. I’m so incredibly grateful for my support teams: my husband, parents, family and my friends from Peterborough as well as those all over the world and more particularly my team of supporters in Coronado, Panama – YOU ALL helped me to stay positive through this journey with your ongoing encouragement, flowers, gifts, food and love. While it’s not quite over yet, I wanted to share these lessons with you. There are, after all, lessons in all aspects of our lives – we just have to be still enough to recognize them! This entry was posted in Uncategorized and tagged breast cancer, Denise MacDonald, Triple Negative Breast Cancer. Bookmark the permalink. 4 Responses to Who Knew…? Denise, congratulations on completing this part of your treatment. You truly are an amazing woman. Sharing some of what you have learned is a beautiful affirmation as to who you are. Your words serve to show me the positive things we sometimes fail to see or forget o appreciate. As your chemo door closes may you have many wonderful moments coming your way. Thank you Debbie. Your kind words always mean so much. YAHOO! way to go Girlfriend, so proud of you and we in The Port are always thinking of YOU! Thank you Mel – I have SO appreciated all of your support, cards, and love. You guys are amazing!